The October birthstone is found in a range of colors that will compliment any wardrobe. 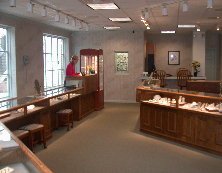 Opal offers an abundance of color including flashes of red, orange, blue and green. The most rare and valued variety is the black opal, which displays its flashes of color against a dark background. Opal is a form of silica, chemically similar to quartz. Precious opal typically contains from 6 to 10 per cent water. The water content can be as high as 30%. The color in precious opal is caused by an array of silica spheres reflecting and interfering with the passage of white light, separating it into the colors of the spectrum. The name opal is partly descended from the Greek word "Opals" meaning "to see a color change". It is a rather delicate gem which is most often cut in a smooth domed shaped or in a flat disk to bring out its natural beauty. 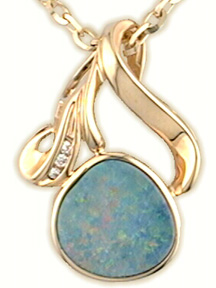 Historically, opal symbolized fidelity and assurance Later opal came to represent religious emotion and prayer. The primary source of precious white and black opal is Australia. Fire opal, typically a milky orange color is found in Mexico, Brazil, Australia, U.S., and Turkey. Color: white or light gray background with flashes of color; blue or green background with flashes of color; orange.